This is a goody basket. I love this basket, it sits at my carpet time. It is full of "stuff" I use. The second picture you see is of lip glosses. I change these out frequently. At the end of the day the children can choose a smell you put it on their hand. You can also do roll on glitter, which is a huge it! 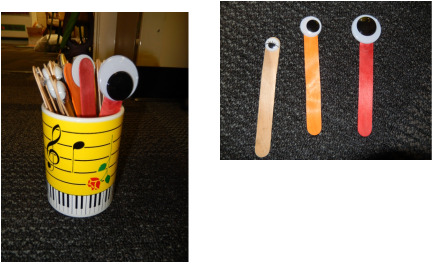 The third pictures is just a little container I put tape around and decorated. It has rice and beans in it. 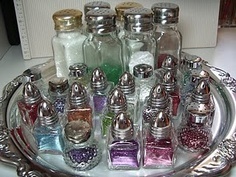 As children come to the carpet I can be sprinkling this on their heads, I say it is smart glitter, or quiet dust etc. The last picture is baby lotion, it is covered in decorative tape. There is glitter in the lotion, and it can also be quiet lotion. As children come to carpet, or get ready to leave for the day, they can have a squirt of glitter, it keeps their hands busy and quiet! This is a transitions bucket. I put transitions items all over my room, as I may not always be in the same place. There is a rain stick, a musical instrument I can blow into, maracas, and other things such as bells etc. Anything you use for a transition can go in here. Make your own rain stick! It is so fun and easy. 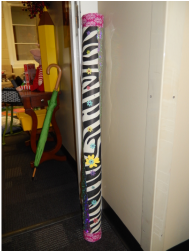 This is a large tube from a carpet for the classroom. You can make these out of paper towel tubes too and laminating tubes. Put nails all over in the tube. Cover it in whatever paper you choose, but beans and rice inside, tape the ends, and decorate! You have your very own rain stick! These are pointers for children to use when they read, or are at centers. Sticks with eyes glued on! This is a classroom velcro bag! This bag should hang somewhere you can get to it quickly. Inside your bag are photos of children. The outside has velcro and so do the back of your pictures. You can use this to quietly excuse students, practice friends in the classroom, practice recognizing friends names, and this works well for student have trouble following directions. 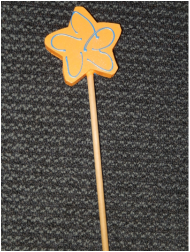 Show and tell stick/Speaking stick. When we have show and share/Show and tell or someone is speaking they hold this wand. They are the ONLY person that should be speaking. It helps children at the beginning of the year learn how to listen to other people, and know when the appropriate time to speak is. If you are holding this stick you must also stand and speak in a loud voice, and in a complete sentence. Box Felt Boards. These felt boards can be made out of shoe boxes, pizza boxes, or any box you find. 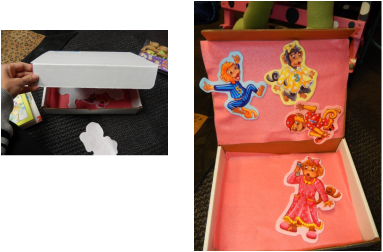 Glue felt to the box, and the entire thing becomes a felt board. Much cheaper than buying each child an individual felt board to use. Great for letters and spelling, or math games. Make sure to take pictures of your students during the first week of school. 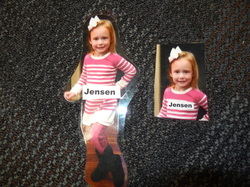 Label the pictures with their names, you will use these during the school year for many different activities. Caught cha being good! 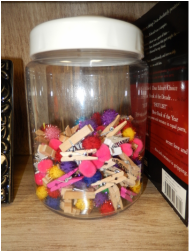 These are small clothespin with puffs glued on the end. These were not given out very often, they were "Special" and the students LOVE THEM. If I saw a student displaying exceptional behavior, or helping a friend or talking nicely they got one. They could pin it to their shirt! They were so proud to show their families! I explained what they were at the parent meeting before school started. This was my behavior management chart. It is s stop light made out of wood. At one time it was cemented into a flower pot and decorated. Since I travel around now, I took it out ad only show the top part. 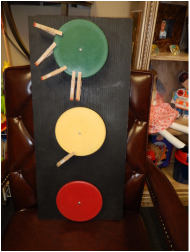 This helps with classroom management, and as the student moves from green to red, they work on their fine motor development also. Every student starts on green. The only time I speak to a parent or write a note is if they get a red light ticket. This is a fun crayola tin I found. Inside I keep good job, great attitude etc bracelets for students who had a great day! Make your own shelves. 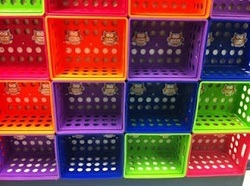 Get colorful crates, tie them together, and you have shelves! 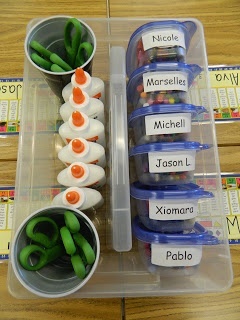 This is an easy way to organize the tables that your students sit at. Small containers with crayons, markers, or whatever you want them to have, make sure the names of everyone at the table are on the containers, then have glue and scissors separately. I used two different colors throughout the year when I taught morning and afternoon Pre-K. I always did Blue in the morning and red in the afternoon. This folder shows a very simple way to communicate with parents and have that home school relationship. This will help in your classroom daily! It will save time, and a mess. 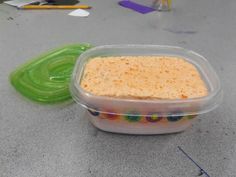 Get a plastic container, put glue in the bottom, cut a sponge and put it in the container. The sponge will soak up the glue, and little pieces of paper can be whipped across the sponge, with just enough glue! 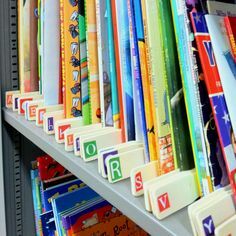 I learned when I was student teaching to put my books in alphabetical order so that you can find the book faster. I always did it by title, because I wasn't good with author's names. Either way, Paint sticks at Wal-Mart are free. Grab 26 of them and label them with a letter. Put books in order. You could also do them by theme, and label that way. 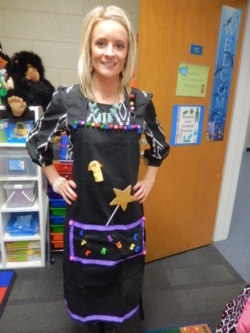 This is a "teacher apron" This really helps when you are doing activities all over the classroom. It has a pocket you can pull objects from to play games, or it can hold glue, tape, or a pointer. 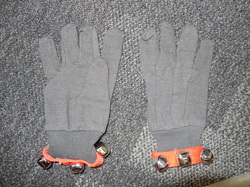 It also have velcro at the top, so it can be used to retell a story or to practice numbers, letters etc. This apron was purchased at Bed Bath and Beyond. It is long and perfect for having lots of work room. handy bag! 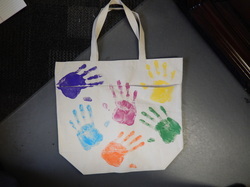 One bag, and put children's handprints all over it. Fill your bag with props for the day. I change them out frequently. Open the bag and let children feel what is inside. Give them clues. You can also use this to introduce new concepts. You can also use this bag as children find their individual sitting space. You can put exercise pictures, props for a song, or puppets. The more unusual the better! 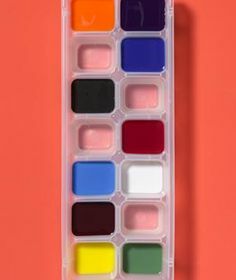 Use an old ice cube tray to put paint in. It does not spill! We all know how messy glitter is! Well here is an example of how to make it a LITTLE more manageable. Salt and pepper shakers!! 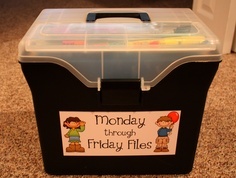 This is a container that helps teachers manage classroom plans for the week. In my classroom I did mine a month at a time. These types of containers help when a sub has to come in unexpectedly.